All great vacations seem to have to be bookended by horrific air travel debacles, at least if my recent experience has been any indication. And when you're hanging around the airport for hours, waiting to see if you make it off the standby list, the last thing you want to realize is that the airport clock - the official, trustworthy, LED airport clock - is stopped. Besides being deeply discouraging, this is very out of the ordinary. Analog clocks can stop, and we don't think too much of it: they're mechanical gadgets that can wind down, lose power, or break, and just stop where they are, and we have an intuitive understanding that this can happen. But LED clocks, we expect to be either running properly, off entirely, or blinking the "12:00" of death. This one wasn't blinking; it was on but not changing, giving the same bogus time to any travelers unfortunate enough to glance at it, for at least three hours. That's not a state that most people would even think possible for this device! Having witnessed this state, I'm guessing that all the clocks in the airport are centrally controlled, and the central controller linked to an atomic clock signal (you know, so you can know with complete accuracy just how late you are). In that case, this clock must have had its control link broken, but still kept its power. So this is a case of non-failsafe design; a better design would have the clock recognize that its control link is down, or know that something's suspicious when it hasn't seen a minute change in more than, say, 120 internally-counted seconds. (These are each very simple detections to make, adding negligible or no cost to the clock's circuitry.) 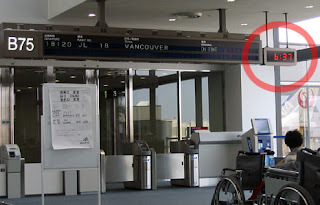 When either of these problems are found, the display would change from steady to flashing to alert travelers not to trust it, or turn off entirely to not add to the already saturated confusion of the airport terminal. As is, If I ever see this again, I'll just have to hope I'm not really in some kind of twilight-zone airport hell!